Speed Kills, but is it as Bad as Drunk Driving? Actually, Yes. 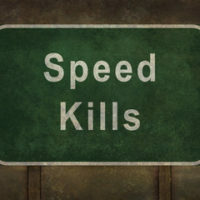 In a safety study released last year, the National Transportation Safety Board (NTSB) concluded that speeding is just as dangerous as drunk driving in terms of the number of lives lost to car accidents caused by each factor. Read on to learn just how dangerous speeding can be, and contact an experienced Washington personal injury lawyer if you have been hurt in a car accident in Vancouver or Portland. The NTSB safety study, Reducing Speeding-Related Crashes Involving Passenger Vehicles, found that speeding caused very nearly the same number of fatalities as drunk driving: from 2005 to 2014, 112,580 people lost their lives to speeding-related crashes, while alcohol-impaired driving was responsible for 112,948 traffic fatalities. The day after the report was released, Jonathan Adkins, Executive Director of the Governors Highway Safety Association, issued a release applauding the NTSB for raising awareness of the risk of speeding. Calling it a “forgotten issue,” Mr. Adkins lamented how speeding is not given the same social stigma as drunk driving, despite the comparable results in terms of fatal accidents. As the NTSB study points out, speeding not only increases the chances of causing a crash; it also makes any crash that happens much more severe in terms of injury than a lower-speed collision. Speeding drivers have less time to react to an emergency situation by braking or safely making evasive maneuvers. Speeders need both more time and more distance to avoid a crash due to a sudden slowdown in traffic, an object in the road, or an unexpected maneuver from another driver. Driving at high speed also makes it more likely for the driver to lose control when suddenly braking or due to road conditions such as a loose or slippery surface or a winding road. When a crash does happen, the faster the vehicles are traveling at the time of impact, the more severe the accident will be. Not only is the force of impact related to the speed of the vehicle, but this relationship is exponential. High-speed crashes are therefore much more likely to deliver deadly force than collisions occurring at even slightly lower speeds. Crashes caused by speeding take the lives of innocent victims every day across America, and Vancouver, Washington is no exception. In May three out of the four people traveling in a BMW were killed when the driver lost control of the vehicle and hit a tree. As reported by KGW8, police believe speeding was a factor in this horrific crash. Speeding is often considered per se evidence of negligence, and injury victims will often have a viable claim against a speeding driver, whether they were in the same car, another car, or hurt as a cyclist or pedestrian. To speak with an experienced and successful Vancouver car accident attorney after an injury to yourself or a loved one, contact John Lutgens at 360-693-2119 for a no–cost, confidential consultation on your claim.